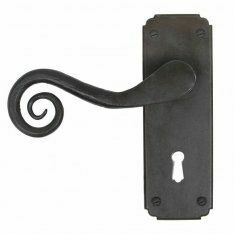 From the Anvil lever handles on backplate are the perfect choice for rustic homes, cottages and medieval-style houses as many of their hand-forged lever handles have an antique and vintage look, such as pewter regency lever latch handles, gothic curved lever handles, Tudor lever handles and curly lever handles. There are also various Anvil lever handles which can be used in more modern homes and apartments, for example the polished chrome Newbury lever lock handle and the polished nickel Newbury euro lock handle. Within this selection of handles on backplate, we supply various types handles, from lever latch handles to lever bathroom handles. Lever latch handles, such as the Avon lever latch handle, are used on doors that don’t require a locking mechanism, while lever lock handles are used on doors that need to be locked by a key. The aged brass Newbury lever euro lock handle is a great example of a lever lock handle. Lever bathroom handles are a good option for bathroom or toilets, as these come with a snib which allows the door to be locked from the inside and a release slot on the outside which can be opened in case of emergency with a flat head screwdriver or coin. The Monkeytail lever bathroom handle and the polished chrome Newbury lever bathroom handle are ideal for these rooms.